What do you do when you go on vacation to California? One of my favorite things to do when I visit my favorite state is take a trip to Napa Valley, or more accurately St. Helena. Our first stop on our wine day was to Domaine Carneros. 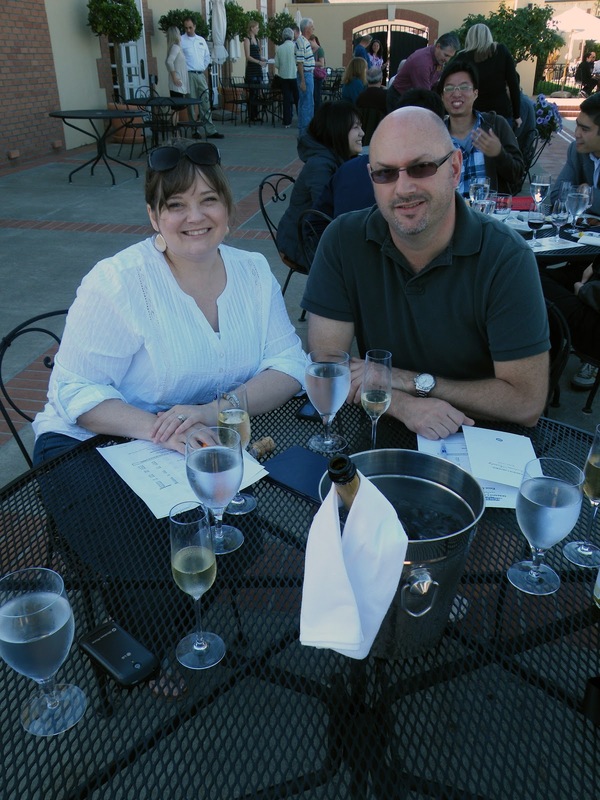 Have you never heard of Domaine Carneros? No worries, I hadn't either. But, it's now on my list of wineries to see when visiting Napa. We started with a bottle of Le Reve and from there our helpful waiter brought us four or five tastes of the winery's other selections. We were feeling good enough by the end of our tastings that Bran didn't even notice I ordered a case of sparkling wine to be shipped home. OK, he might have noticed I ordered the case of wine, but I'm hoping he might not have noticed that three of the bottles were of Le Reve. From Domaine Carneros we made our way to my favorite winery, V. Sattui. 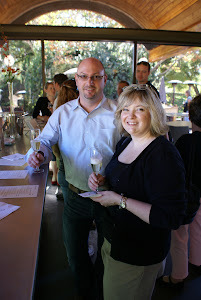 Since our trip to Napa was on a gorgeous Saturday afternoon the winery was packed with tourists. So packed that their parking lot was full and we were directed to park in the vinyard. V. Sattui has a nice area for wine tasting for the general public and a quieter area in "the cellar" for Cellar Club members. Lucky for us we were able to avoid the mass of people and make our way to the cellar. Before we left we'd ordered another three cases of wine. Bran and I use our trips to Napa to purchase wine. We find that the wine we purchase directly from the wineries isn't much more expensive than wine by the bottle in the grocery and liquor stores back home. With the added bonus that the wine we purchase in Napa is not available at retail outlets. So, not only are we ready for the holiday season, but we've collected wine that will be a unique experience for our guests and for those who recieve a bottle from us as a gift. So go visit wineries, taste the wine, and make a couple purchases. I made stuffed peppers for supper again last night. With the leftovers from my first attempt earlier in the week, my husband has now had stuffed peppers for supper four nights in a row. Cut the five bell peppers in half lengthwise, seed, and arrange in a rectangular baking dish. Season the inside of the empty pepper shells with salt and garlic powder to taste. Brown the ground beef, onion, minced garlic, and mushrooms in a skillet. When the meat is cooked transfer it to a large mixing bowl. Add the cooked rice, tomato sauce, tomato paste, cheese, Worcestershire sauce, and seasoning. Mix together and spoon into the pepper halves. Bake in a 350° oven uncovered for 40 minutes. The peppers made my house smell like pizza baking! I topped my cooked peppers with some Parmesan cheese and served them with french bread and a salad to make it supper. Give these a try - or get out there and tweak your own recipes to fit your tastes. I made stuffed green peppers for the first time ever this week! Yes, the first time ever. It all started with a conversation recently with Brad about our crazy collection of cookbooks. Both of us love kitch, and own at least a couple of vintage 1960 era cookbooks. If you own vintage 1960 era cookbooks (or even cooked in the 1960s) then maybe you've asked the same question I asked Brad, "What's the deal with all the pimentos?" Really, what was the deal? Since the '60s are a little before my time I can only surmise that they must have been "the thing" at the time. While thumbing through the pimento laden cook book I stumbled across a recipe for "Old-Time Stuffed Peppers". Bran likes stuffed green peppers so I thought to myself, "Why not? I'll give stuffed peppers a try." I ended up cobbling together my own recipe from the one in the book with recipes I found on-line. Following the 1968 recipe exactly was out of the question as the original recipe asked for an alarming amount of salt and MSG. Pimentos and MSG - yum! The peppers came out well, but I'm not happy enough with them yet to share how I made them. When I'm happy with them I'll share, I promise. Good thing Bran likes stuffed peppers because I'll be experimenting with them again tonight! Sunday was a good day to try new recipes. I made up a nice tasty pan of cornbread for breakfast and made a "Spicy Pasta Pie" for dinner. The "Spicy Pasta Pie" is basically baked spaghetti. I could have figured this one out for myself, but it was a nice change from my usual standby "throw what's in the fridge" spaghetti sauce. Bran liked it enough to tell me that I could make it for him anytime I wanted. Cook the noodles to al dente and drain. Return noodles to the pot and add the egg, tossing to coat. 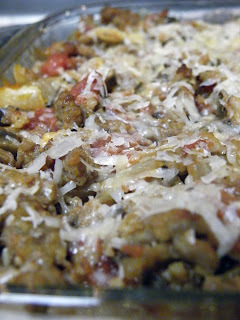 Layer pasta on the bottom of a square glass baking dish, cover with the 1 cup mozzarella. Cook the sausage, mushrooms, onion, and garlic in a skillet until done. Add the diced tomatoes, tomato paste, and seasonings. Top the noodles and cheese with the meat sauce. Cover with foil and bake in a 350° oven for 30 minutes. Remove from oven and top with the Parmesan cheese. We served it with a salad and it made a wonderful Sunday afternoon supper. I got up this morning and thought, "why don't I try something new today?" After a raid of my pantry I discovered I had a bag of yellow corn meal. Obviously at some time in the recent past I thought I'd try making cornbread from scratch instead of from a box. I'm sure glad I did! You should try it too, it's easy and delicious. Beat the eggs then add all the other ingredients, mixing until smooth. Pour the batter into a greased square baking pan. Bake in a 450° oven for 20 to 25 minutes or until done. I covered a slice with butter and honey and had it with my morning cup of coffee. Yum! So, I'm looking back at my last post and I'm wondering, "was I drunk"? One new recipe a week for an ENTIRE year? Holy crap I can hardly focus for more than a week. At least it feels that way sometimes. Let's face it. There are going to be weeks where I'm out of town, weeks when I'm super busy with some other crazy part of my life, even weeks I just don't feel it. I'll probably have tons of "just don't feel it weeks". Knowing is half the battle, right? But then there are going to be those crazy times, especially around the holidays, where I'm going to be doing more cooking and baking than usual. I think it's a fair trade so here it is: at least 52 new recipes one year from today. Today because I made something new this afternoon from part of my pocket recipe magazine hoard: Spiced Apple Coffee Cake, adapted from Bette Crocker Best-Ever Fall Baking 2012. As I was pulling the cake out of the oven, Bran came in from the garage and stated "whatever that is in the oven I have first dibs". It did make the house smell fantastic. Cream together the brown sugar and butter, add the egg. In a separate bowl mix together the flour, baking powder, allspice, and salt. Slowly add to the butter, sugar, egg mixture. Fold in sour cream and apples. Spread the batter in a greased and floured square baking pan. Cut together the brown sugar, flour, and butter. Add the pecans and spread over the cake batter. Bake in a 350° oven for an hour, or until a toothpick inserted in the middle comes out clean. It is a very good coffee cake! I have an embarrassing confession: I'm addicted to those little recipe magazines at the check out line of the grocery store. You know the ones. I ignore the delicious candy, the shocking tabloid headlines, even the convenience of those forgotten things like batteries and lighters to see what wonderful new recipe magazines are offered to me. They lure me in with their bright colors, tasty treats, and comfort food goodness. I pick them right up and toss them on the conveyor belt; and when the clerk asks me if I'd like to just put them in my purse I say "yes, yes! ", my fingers itching to touch the pages of future scrumptious dishes. At home after the groceries are put up the first thing I do is start through the magazine making note of which recipes look and sound the best. The sad thing is that I can probably count on one hand the number of times I've actually used a recipe from one of these little gems. But my admission of addiction is worse; not only do I buy these magazines but I keep them, sometimes for years. I pull my collection out around this time of year and start thumbing through them. Then I buy more. lol. To placate my growing shame at such an addiction to these recipe magazines I'm going to challenge myself to one new recipe a week. one recipe a week to be blogged about, whether or not it's a "keeper"
Sound like fun? Sounds like fun to me. I'm off to my recipe hoard to choose something new... but first a drink.